Well I have been watching the plants to see when the right time to pick them is and I think I found it. The outside of one of them had turned colored slightly in streaks, another had started to show little hairline cracking or sorts. I picked them both and cut them up and put them on a burger with cheddar cheese. WOW they were amazing and they were HOT. I usually load my burgers with the crappy canned ones, but these things were burning! very happy with the results. Lets hope I get some more since the beetles really gave them hell when they got done with my basil. I think I have mostly dealt with them now (must have crushed dozens of them at night), the basil and peppers are both recovering well. ahhh, I've meaning to ask this very question... how do you know when to pick them! so how long did it take from when they were full size till you picked them? I try to pick mine right before the little cracks show up, but it's no problem if they do. I find the ones with the cracks somewhat hotter than the smooth ones, though. From my admittedly limited experience, the size isn't as important as the taste and texture. My hot peppers (jalapeno and cayenne) don't get as big as the store-bought ones, but they're sweeter and a LOT crunchier, and, incidentally (to the great joy of my wife) about two notches hotter! FYI, putting a piece of fresh-cut cayenne pepper on your tongue just to see how hot it is is NOT something I would recommend. Nick D wrote: FYI, putting a piece of fresh-cut cayenne pepper on your tongue just to see how hot it is is NOT something I would recommend. I wouldn't think so. Is this something you learned from experience, perhaps? I'm just waiting for mine to ripen another pepper. So far I've been enjoying Hungarian wax peppers out of the Burpee hot pepper mix. Those things are surprisingly hot! We are growing hungarian wax peppers from the local seed and feed. They were the first ripe pepper. DH picked them out because they said sweet and hot on the label. The first one that was ripe, he bit right into and started to chew......BAHHHHAhahahahahaahahahaaaaa! I bout peed my pants laughing at him! He drank about a half gallon of milk and finally a few spoonfuls of sourcream cooled him off. I touched it to my tongue and it was at least as hot as a ripe Cayenne. Poor thing, bless his heart..but it was funny. They would make a great chile oil or flavored vinegar! LOL! My Hungarian wax peppers were also the first to ripen. (not counting one sad tiny JalapeÃƒÂ±o produced by one that I overwintered) I think I picked about 5 or 6 of them already and had to freeze about three of them. The wax peppers look like banana peppers. My grandma thought so, but I told her they are not. Fortunately she doesn't touch my peppers. I learned very early a little bit goes a long way and they make for tasty burritos, sandwiches, etc. They do seem as spicy as a cayenne pepper, but I think they taste a bit sweeter. Maybe it is just me, but I notice after the burning feeling stops, the warm feeling after is somewhat soothing. I'll have to let a few ripen to see the orange color. Im growing all three peppers talked about on this thread. Hungarian Wax, Cayenne, and Jalapeno, They Cayenne definetly seems the hottest but the Hungarian wax definitely has a good burn too, lol. 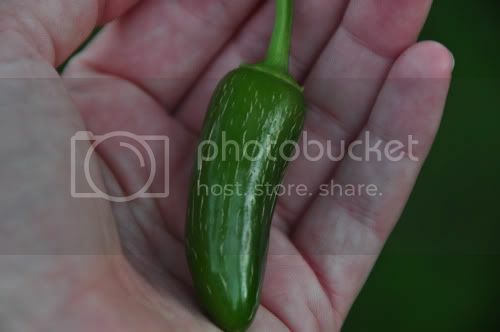 And the Jalapeno's? well they are just Jalapeno's, but they definitely are the biggest of all my pepper plants and produce nicely. And yes biting into a fresh cayenne pepper to test its heat is quite painful, lol. And i also tried this method with a Carribean Red this year, lol. OUCH! Them Jalapenos are a good all around pepper tho. Good producer, not super hot and great for lots of different dishes and cooking methods and cold salsa's. My freind does this with pepperonchini. But he uses thinly sliced beef tenderloin than bacon and then grilled. Served with a home made sauce they are to die for. OK, now I have to go buy some bacon! Great thread. I'm growing hot banana peppers, not sure if these are the same thing as a Hungarian wax pepper (they look alike). I have a question, do any of you save your pepper seeds? I tried this with the jalapenos last year, but they never grew....not one of them. It seems like you have to let the peppers be on the plant for a long time before the seeds mature enough. I will be having the bacon wrapped peppers this evening cooked on the grill with a sweet potato. When they are cooked, the steak goes on. I'm also steaming a pot of carrots, onion, and squash, from the garden. I will add some cabbage to the mixture from the grocery store. To many pests for me to grow cabbage. Thank you for reminding me about the bacon wrapped jalapenos. I've always loved them. We used to put 1/2 of a jalapeno with cheese inside of a dove breast. Wrap the breast in bacon, hold the packet together with a toothpick and grill over a wood fire. They were great. You can do the same thing with small pieces of chicken breast. Simply make a pocket in the breast or wrap strips of breast around the cheese stuffed pepper half. Then wrap the bacon. Didn't have chicken breast or dove breast tonight so I just split the peppers, removed the seeds and membranes, filled with cheddar cheese, wrapped in bacon; and grilled. I made six of the wrapped peppers tonight hoping the wife would eat some. I couldn't detect any pepper heat, but the wife tasted one and said they taste great, but are to hot for her. I enjoyed all six. I need to buy more bacon. I have a lot more peppers to cook. Since I haven't been using them very fast, some of mine have turned red on the plant. I pulled a few of those and used them. They had a totally different taste than the green jalapenos and may have even tasted better.